How to make a TannerGonzalez Steak Restaurant Burger. Here is my secret to making a steak restaurant burger like you would have in Elways Cherry Creek or 801 Steakhouse. The burgers are always amazing steakhouses. Here are the tips to make a TannerGonzalez burger that tastes as great as a steak house burger. Make your burgers the envy of the neighborhood. First it’s about the meat and not really the best quality low fat beef. It’s about getting some good butcher shop quality meat from a butcher or a farmers market in the summer. Even a quality supermarket like whole foods has quality meat that is fresh and great tasting. The key is to get a same date meat. The grade of beef is important but the real trick here is to avoid the mistake of buying lean ground beer or sirloin. I am sure the health conscious people cringe at this but you need a good burger and this isn’t the time to go lean. You need a good 70 to 30 (70/30) meat for this burger. You can use lean meat for the other things like burritos or a Bolognese sauce. The fat in this meat is what makes the burger juicy vs. an overcooked, dry burger. Grilling this 70/30 meat will keep your burger moist. Do NOT make a meatball – Do NOT mix in anything into your burger. The 70/30 burger stays together well enough with the fat content. Just be sure to make the burger bigger than the bun to allow for the burger shrinking a small amount. Put a depression into your patty to create a flat burger vs. a ball burger. Do NOT over spice this burger. Stick with Salt & Pepper, I personally use McCormick Steak Seasoning. Restaurants generally use a seasoned salt. Do NOT press down on the burger! (specially on the grille) Pressing down squishes out ALL the fat which will result in a dry burger. Only make a smashburger on the grill (which is another type of burger, which I will write about later) You don’t want to press this great masterpiece down. Shape your burger from the start and only flip your burger and be patient, no need to cook this quickly. Which comes to my next point. Do NOT overcook your burger. A 1/4lbs burger only takes 3-5 minutes per side (depending on your cooking temperature) . If your beef is fresh a little pink is okay, but if you prefer a fully cooked burger use a meat thermometer (if you cut in all the juices run out, and you’re back to dry burger). The internal temperature of a burger should be 160˚F. Let your burger rest off the grill, lightly covered in tin foil for 2 minutes so the juices re-distribute. Following these tips will give you burgers that are juicy, fresh-tasting just like the steak houses. Top it with your favorite toppings and enjoy! 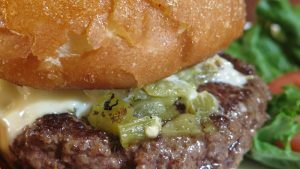 My favorite burger is a green chile cheeseburger: Two patties with Yellow American Cheese, topped with Green Chile.